In december 2003, André and Ole Kristian met for the first time to form a band through which their musical ideas could be channeled. Both being fans of dark, yet melodic music, they set out to gather some musicians that shared their passion for this music. Four months later they had recruited Eirin and her angelic voice, bassplayer Kristian and Tom Remi Flygel. Shortly after, Where Angels Fall went into JL Studios to record their debut EP "Dies Irae" that were to be released early autumn 2004. Tom Remi left the band in june 2005, and the band continued as a quartet from this point on. By the time of june 2005, the band had enough soundmaterial for a fullenght CD and were offered a contract by the norwegian label Edgerunner Music. The band signed up and set out to Toproom Studio to record the Illuminate CD. 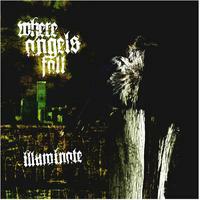 Where Angels Fall can be described as groovy metal with elements of gothic, classical orchestrations and electronica. Melodic female vocals stands out as an opposite to the hard riffing. They have a reputation as an energic and good liveband with choirs and orchestrations on tape to give the audience the full spectrum of symphonic metal live!